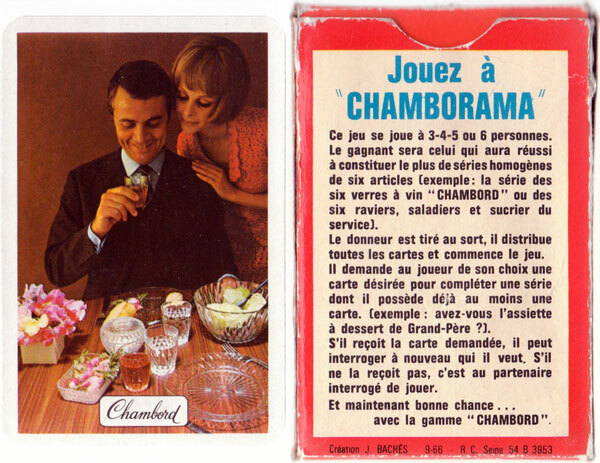 This “Jeu de Familles” from the 1960s promotes Chambord glassware. The object of the game is to complete family sets of the same item (wine glasses, small dishes, larger dishes, sugar bowls, etc) by asking opponents for a particular card, for example: “avez-vous l'assiette à desert de Grand-Père?" Above: the reverse of the cards and back of the box. All images courtesy Rex Pitts. The signature on the Monsieur and Grand-Père Chambord cards is that of Jean Bachès, the artist and graphic designer.